It doesn't get any more Little C&G than this, a big bowl of freshly made pasta smothered in pesto sauce delivered by a tuxedoed waiter at the elegant Antico Martini in Venice, Italy. 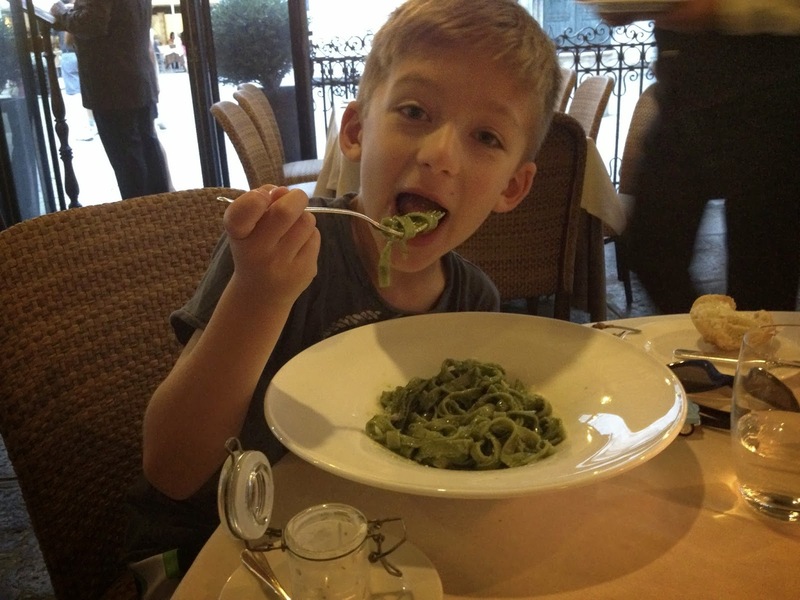 Today my happy little adventurer turns 9, and to celebrate I thought I'd write a review of his absolute most favorite restaurant anywhere in the world. If you look at the list of places we've been, you'll notice there's quite a lot to choose from but when asked he'll say "Martini's" without a moments hesitation. 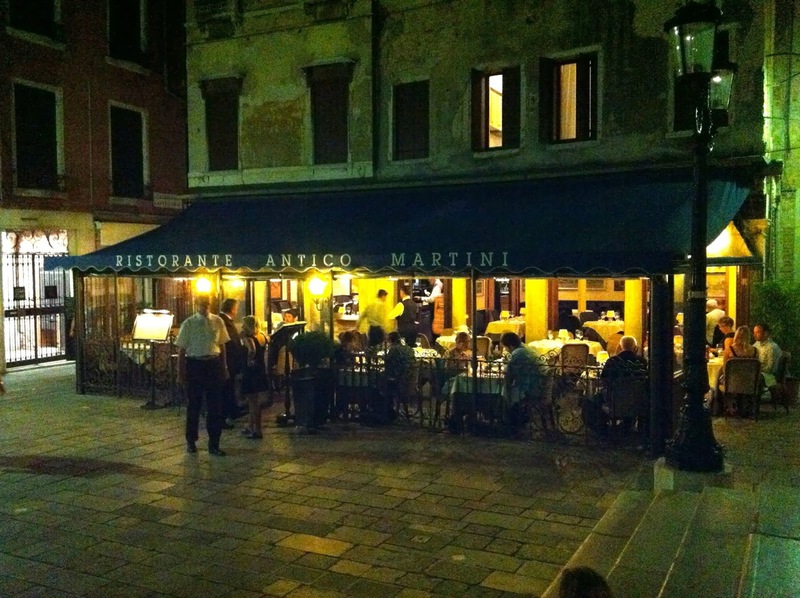 Antico Martini is a classically beautiful old Venetian restaurant on the square next to the world famous opera house, Teatro La Fenice. I'm sure their usual patrons are a bit better dressed than we were on the hot and steamy night we visited, but they welcomed us with only a few raised eyebrows. Attached to the restaurant is the more casual VinoVino and a crowd of waiters came over and insisted we meant to eat there, not on the more formal side. But I had fallen in love with the beautiful terrace and remained firm that we wanted a table outside overlooking the famed opera house. It was easily two hours before most Europeans come out for dinner so they relented and led us through the restaurant out to the terrace. True to Mrs. C&G form I neglected to look at the prices on the menu & Mr. C&G shot me a look of alarm when he opened the menu. Gli antipasti (starters) on the menu averaged €25 ($35) and everything went up from there. After finally securing a table we certainly couldn't get up and walk out, instead we resolved to enjoy every expensive bite (and maybe order one dish each. And only one bottle of wine). Imagine an Italian version of Downton Abbey's Mr. Carson and that was our waiter for the evening. Very stiff backed and elegantly attired, but when Little C&G politely asked if there was any pesto available our waiter smiled and his formal attitude just melted away. After checking with the kitchen he came back and said "The chef would be honored to prepare the requested dish for the young gentleman". From then on he couldn't do enough for either of my bambinos and it was an amazing unforgettable meal. We were all very sad when our dessert plates were cleared and our sophisticated evening came to an end. Our charming waiter bid his new best friends a very buonasera and we crossed the square to enjoy some people watching from the marble steps of the opera house. Both little C&Gs learned a valuable lesson that night, manners and good behavior will always get you far. And that if you don't see pesto on the menu in a restaurant in Italy, it couldn't hurt to ask. 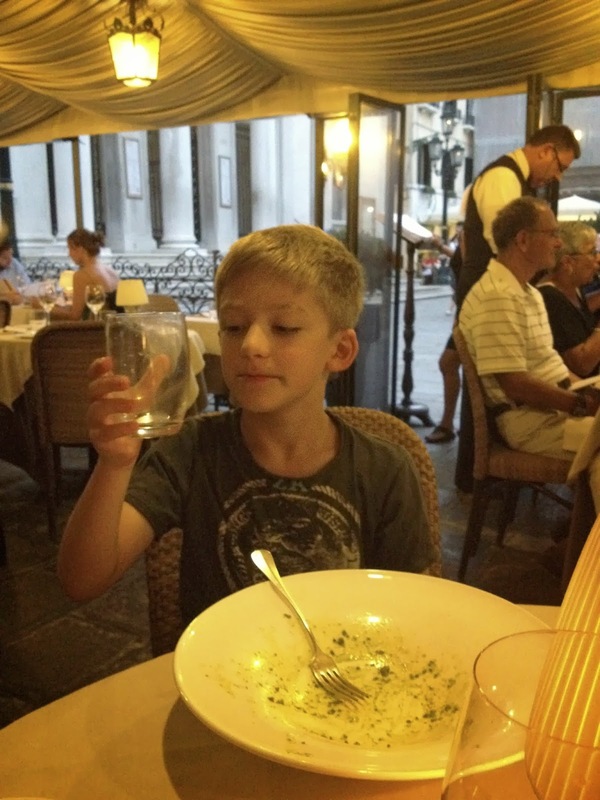 Cheers & buon compleanno to my lovely little boy!